Need some shade? 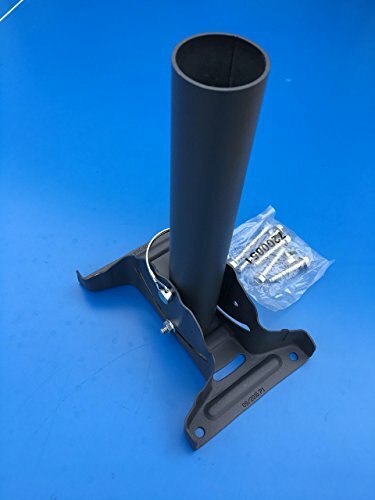 This umbrella holder works great for decks, docks, pontoons, patios, picnic tables and anyplace else you can fasten it with the included lag screws. It's adjustable and comes with a safety pin to keep the wind from carrying your umbrella away. Made from durable coated steel our umbrella holder will give you years of use. Holds umbrellas or flag poles with a pole diameter of up to 1 3/4". Please measure your umbrella pole and confirm that it is no larger than 1 3/4". Mount has small footprint of 6" x 8 5/8" with incredible strength! REQUIRES INSTALLATION. Mount to wood, composite decking, concrete (concrete anchors required) 12 1/2"H x 6"W x 8 5/8"L 3.5 lbs. Lag Screws Included. Tools needed: Drill, 5/16" drill bit, 1/2" or 13mm hex drive bit, 1/2" or 13mm wrench or socket. You must also drill a 5/16" hole through your umbrella pole for the safety pin to go through and secure your umbrella to the holder. Limited Lifetime Warranty. We will replace your umbrella holder for free minus the shipping if your holder should ever fail. The strongest outdoor adjustable umbrella/flag pole holder you can buy! Perfect for decks, docks, pontoons, patios, picnic tables and just about anything else you can fasten it to. Adjustable with a safety pin to hold your umbrella or flag pole securely. NOTE: You must drill a 5/16" hole in your pole for the pin to go through. Holds umbrellas or flag poles with a pole diameter of up to 1 3/4". If you have any questions about this product by The Shady Monkey, contact us by completing and submitting the form below. If you are looking for a specif part number, please include it with your message.